The Quebec Technology Association (AQT) contributes to the influence of Quebec’s IT industry companies as well as the growth of this economic sector. With its 500-strong membership, the AQT unites and supports ICT industry leaders by fostering skill development, business performance enhancement, and the advancement of commercial practices within the industry. 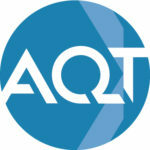 A non-profit, self-funded organization, the AQT acts as a representative and public advocate for the industry, and is now Quebec’s largest ICT business network. To learn more, please visit the AQT website. Office opening in Quebec city to better serve members of that region. The AQT and its 10-member team move into a new facility in Cité du Multimédia for the greater convenience of its members. The 10th edition of CEO Vision welcomed a record number of participants. This annual event has proven to be an effective launch pad for new business, which is a critical factor of business growth. Partnership with the Government of Québec for “Salon des TI”. The Inter logiQ Network announces its affiliation with three remote associations. The Network enters into agreements with major partners. The CPLQ becomes the Inter LogiQ Network. First edition of the Big Bang Forum on ICT marketing. End of grants. Self-financing. Creation of CEO Vision exclusively for presidents of technology companies. Foundation of the “Centre de promotion du logiciel québécois”. Established under an initiative of the Quebec and Canada departments of Communications, the CPLQ exists to help Quebec software producers market their products and services across local and international markets.